Until the Ras al-Jins (Southeast Oman) discoveries, we had no direct information on reed boat structure; iconographical representations and boat models proved unhelpful. However, the reconstruction of a 42.6-foot (13 m) proto-reedcraft based on the Ras al-Jins bitumen impressions, provided valuable information into construction methodologies: there were about 300 fragments of bitumen imprinted with reed, rope and mat impressions on one side and barnacles (Balanus amphitrite) on the other, dating from between 2300 and 2100 BCE.121 The intention in building the prototype was to provide knowledge on the skills needed in its construction, using materials such as reeds (Phragmites australis), rope and bitumen. All materials were sought from Oman. The building process needed the skills to cut reeds, make ropes, put together bundles of reeds (lashing and binding), prepare timber and finally in the mixing of lime and bitumen. Other skills were required to make sails (woollen or mats of reeds or date palm leaf ). 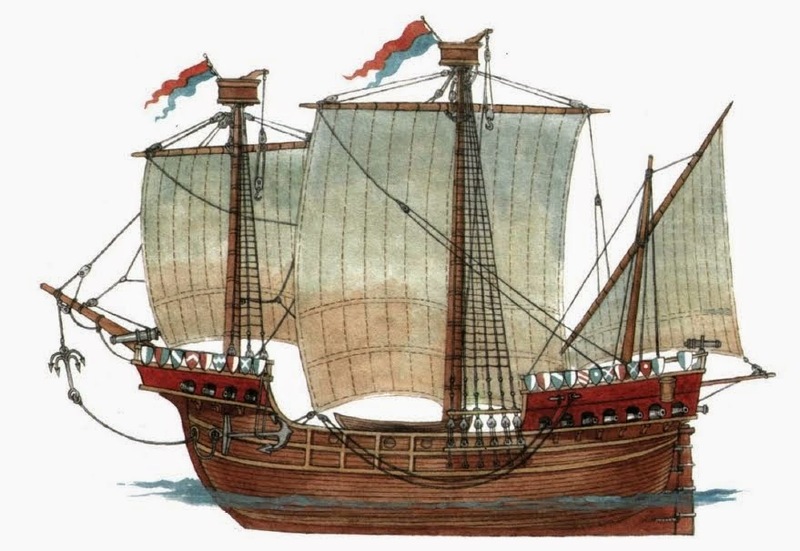 The conclusion drawn from this, Tom Vosmer comments, was that Bronze Age shipbuilding required “a highly organized social and manufacturing infrastructure”, and it would be expected that the crew had similar skills for repairing the ship when it sailed across the ocean. The boat finally sailed in February 2002. One question remains unanswered: whether the reed was local or imported from the Meluhha (Indus Valley) region. 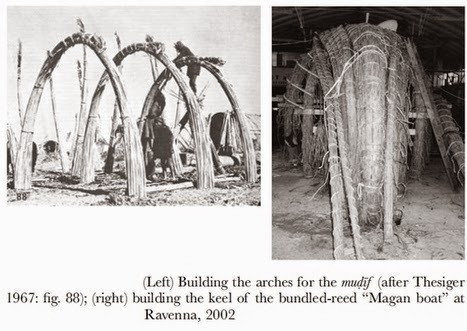 Further experimentation was conducted by Tom Vosmer, in coordination with a research team in Ravenna, Italy, by constructing a bundled-reed vessel named “Magan boat”. The team was inspired by the method used by the Marsh Arabs to build their reed houses (mujÏf), as mentioned earlier, i.e. proceeding upside down; that is the keel, like the roof of the house, is first made with a number of tight bundles of reeds (qasab—Phragmites communis) lashed together to form the hull shell and then long reeds are shaped in a U form which are passed from the middle of the keel to the floor. Based on the evidence of the bitumen fragments, the team decided to put mats on the bundles to protect them from heat and the bitumen from melting. It is interesting to note that with Egyptian reed boats it was the custom to use clay on the inside rather than applying another coat of bitumen. Heat keeps clay dry while bitumen melts and becomes sticky. Textual evidence points to the existence of bitumen-covered reedbundle vessels in the Bronze Age (c. 3000–2000 BCE): an Ur III text from Girsu mentions, among other things, the use of vast quantities of reeds and bitumen; another Ur III text states that 900 kg of bitumen was scraped off a boat. Coating of reed-boats with bitumen is well-known. The Tell Mashnaqa (Northeast Syria) models show what seems to be bitumen coating. Two large models (from 1–1.5 ft/30.4–38.1 cm to 6 ft/121.9 cm in length) found in Ur were made with bitumen and such models seem to appear throughout the Sumerian period. The recent recovery of 22 bitumen fragments of ocean-going vessels belonging to the Ubaid period at Al-Subiyah (Northeast Kuwait) is a significant find. They point to a maritime trade as early as the sixth millennium BCE. Among these fragments one finds bitumen pieces with reed impressions on one side and barnacles on the other. Other finds include a small boat model made of fired red clay. Interestingly, in Mesopotamia ceramic model boats of the Ubaid period were found coated with bitumen. It is possible to speculate from the discoveries at Al-Subiyah that the bundled-reed vessels were secured with rope or cord and coated with bitumen and that the site was used for repair work and maintenance and possibly boat-building. From the experimentation conducted by the Ravenna team, Tom Vosmer observed that: a) the impressions left on the bitumen fragments could possibly be caulking remains, b) barnacles grown on the outside of the fragments could suggest that the bundled-reed boats were oceangoing vessels, and c) from the internal side of the fragments one could see that the reed bundles were lashed with rope and covered with woven mats. The finds, primarily the bitumen fragments, indicate that both wooden and reed boats were constructed, or single boats with a hybrid structure of reed and single-plank technology.